I love Coleman products, and I own a lot of them. Their products consistently prove to be well-made, low-maintenance, reliable and and long-lasting. They also are affordably priced. Most times, if I am shopping for sports equipment or camping gear, I check to see if Coleman makes the item I want. If they do, I usually don’t even comparison shop. Their products are that good. But that doesn’t mean that YOU should buy a Coleman. 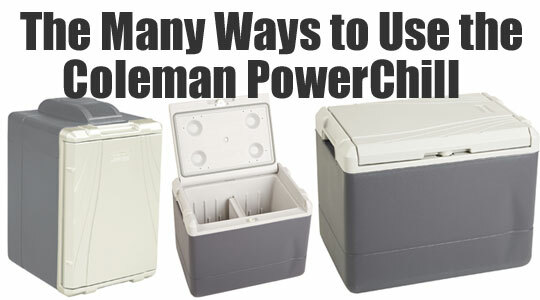 What’s Good About the Coleman PowerChill? 1. Use it like a traditional with the lid opening on the top. 2. Stand it upright so the door opens sideways, like a refrigerator. In addition, the door can be adjusted to open from either direction. The interior compartment also has an adjustable shelf, so you can organize items in a more user-friendly way. On top of that, you can plug the cooler in to your vehicle’s 12V outlet as well as a regular wall outlet. You will need a separate adapter for home/office use, and you can get that here. 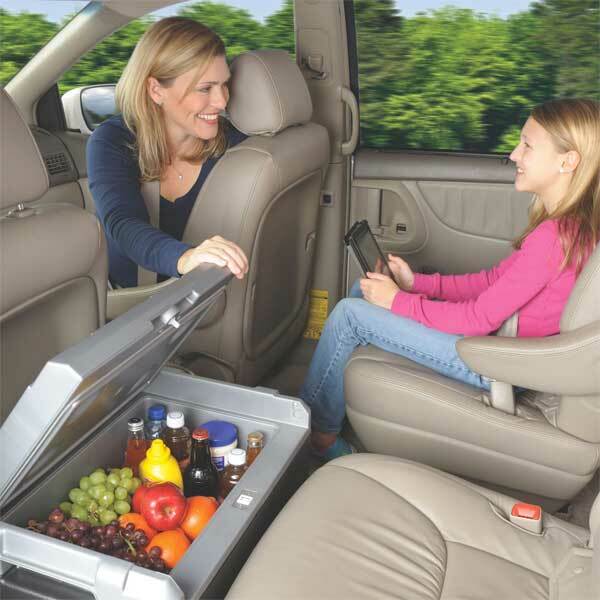 Because the PowerChill is more versatile than other car coolers, it’s easier to use it for more things than just road trips. For example, you can set it up in the office, a dorm room, a guest bedroom or garage, etc.. This versatility is big bonus in my opinion, because the more often you can use it, the more value you get for your money. Lacks Handle: The cooler does not come with a carrying handle or shoulder strap. It does have molded side hand grips so that you can lift and carry the unit, but this is not as easy or convenient as a strap or handle. Bulky: It’s big and it takes up a lot of space. If you only need a personal-size unit and don’t have much extra space in your car, a smaller cooler may be a better option. Yes, it fits behind the seat in the photo above, but that’s a large SUV. No Warmer: It’s not a cooler + warmer. It’s just a cooler. This video discusses common problems that some people experience with this Coleman cooler – and how to prevent them from happening. Very helpful. Coleman makes an entire line of performance coolers, including soft coolers, hard coolers, steel belted coolers, water jugs, marine coolers and more.